[Bobbi Ewing speaking] "I was having a conversation with a candidate and all of a sudden candy was being thrown at me from behind and I looked back to see where it was coming from and there was actually a Harlem Globe trotter spinning a basketball in my cube and tossing candy at me. I was like 'where am I?' We do have a lot of fun here; I can say that on a very regular basis. We work hard but we play hard." [Megha Singh speaking] "My team leaders have no qualms about getting goofy with their staff. They'll do whatever it takes to make the morale positive. It's just fun to see when your team leaders will do a pie in the face contest." [Tyson Mays speaking] "It's an energetic place. DCU tries to make sure that their employees love coming to work. We held special days where if we hit a certain goal a team leader would dress up as a super hero. There was one team leader who actually dressed up as Wonder Woman." [Ben Corman speaking] "They did a sandcastle building contest in the summer in the cafeteria where teams got together and built sandcastles out of kiddie pools filled with sand." [Bobbi Ewing speaking] "We always make time for the fun. 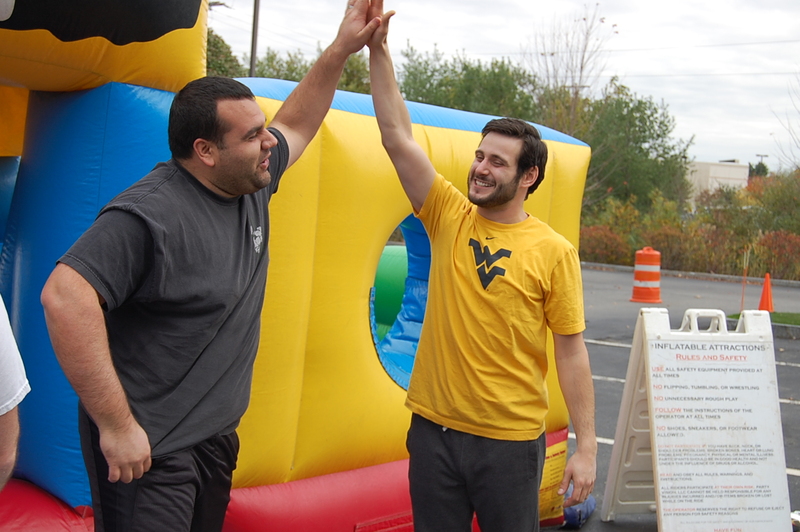 We have off-site events that happen on the weekends and people can bring their families. The events that we do right here on site we've had horse drawn carriage rides for the employees around the building with hot cocoa and blankets. We have an upcoming event where they're bringing a van full of animals that need adoption." [Jessica Whitney speaking] "One of the most fun days I've had at work is DCU Fun Day, where I can see one of our friends dressed up as Dr. Seuss on a bouncy ball going from one end of the cafeteria to the next." [Mike Pusateri speaking] "We have an employee celebration once a year when all the employees get together. A lot of times you don't meet people face-to-face, you're talking on the phone, so at that employee celebration you can just by listening to people's voices 'oh are you so and so' and you get to like talk to them and meet them and have just a really fun time. It's a blast, it's the truth." [Nina Hovsepian speaking] "I like coming to work because we have a great culture here and I love my co-workers. We decided for Halloween we would have everyone dress up in their favorite costume. I had always wanted to dress up like Cruella De Vil and have my kids dress up as Dalmatians, but my kids wouldn't and none of the neighborhood kids would either so my motivation team which we were only eight or ten of us said we'll dress up as Dalmatians and you dress up as Cruella, so I did. 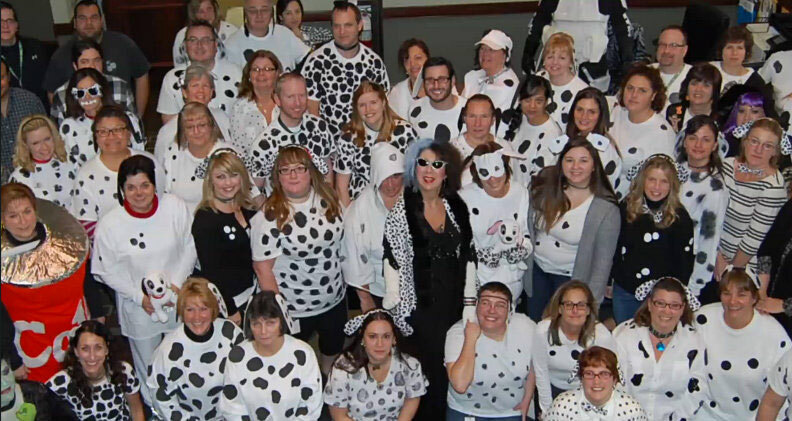 Unbeknownst to me they had emailed the whole department and everyone dressed up as a Dalmatian. So we had 101 Dalmatians and it was really great." DCU is unlike any place you have ever worked, and maybe even any place you've ever interviewed. Many candidates have commented on the smiles they see in the hallways on their first visit—something they don't typically see when visiting prospective employers. It's a first-name kind of place; our people really care about our members and each other and strive to make a positive difference in their lives. DCU encourages an equitable work/life balance for all employees. 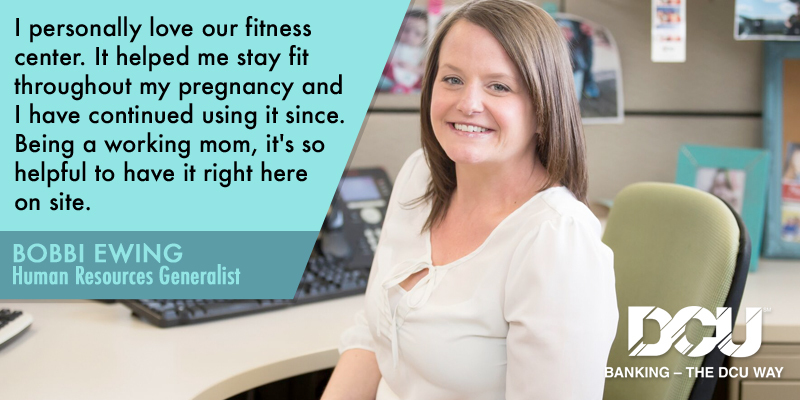 They support this by offering flexible work schedules, telecommuting, on-site Fitness Center with personal trainers, an Employee Assistance Program (EAP) that is open to employees and their families, discounted Legal Services and "Take Your Child to Work Day." The importance of "family time" is recognized by DCU. To help with the increased costs associated with recreational activities, DCU offers employees "free" tickets to the New England Aquarium in Boston, as well as discount tickets to area attractions, amusement parks, and theaters. Additionally, DCU has daily raffles for tickets to the Red Sox, Bruins, and Celtics games, as well as other sporting events and concerts. Also, employees receive a $50 "holiday" gift to help with their holiday meal. [Jim Regan speaking] "I make every opportunity to meet every new employee of the organization on the first day. We spend a little time learning about where you are from, how you found out about the job, what did you do before this, you know a little bit about your families, pets, hobbies and I give people an opportunity to ask us questions. One of the questions that an employee posts to me a long time ago, and it's always resonated with me, was if you had to choose about being invisible, being able to fly or read minds, which would you choose. I remembered what I answered and if you decide to come work at the credit union, I'd love to share that with you." 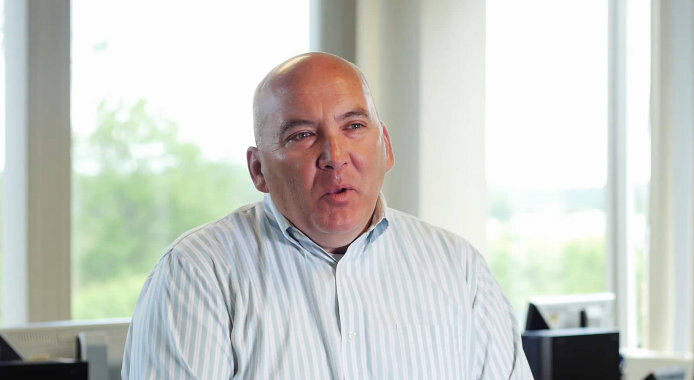 The unique culture starts when new employees are immediately embraced by DCU upon arrival on their first day. Upon entering, they are greeted by the receptionist with a "Welcome" sign. They then enjoy an informal breakfast, which initiates casual conversation and a warm welcome, with the CEO and a representative from Human Resources (HR). By the time the breakfast is complete, the members of the Senior Team know all new employees by name and have offered the keys to success at DCU. This is just the beginning of the "DCU experience." DCU offers a casual dress work environment at its Headquarters and Operations Center and strives to reduce the stresses that are part of everyday life. In both Headquarters and the Operations Center, employees can get chair massages and reflexology, play pool in the game room, take an aerobics or yoga class in the Fitness Center, eat in the subsidized cafeteria, take advantage of the FREE soda machine and seasonal snacks, and enjoy free coffee and cappuccino every day! Additionally, all the vending machines are subsidized; employees only pay 75 cents for beverages and 50 cents for snacks. To help simplify their busy lives, employees can buy stamps, mail packages, take care of dry-cleaning, and benefit from an on-site flu clinic. 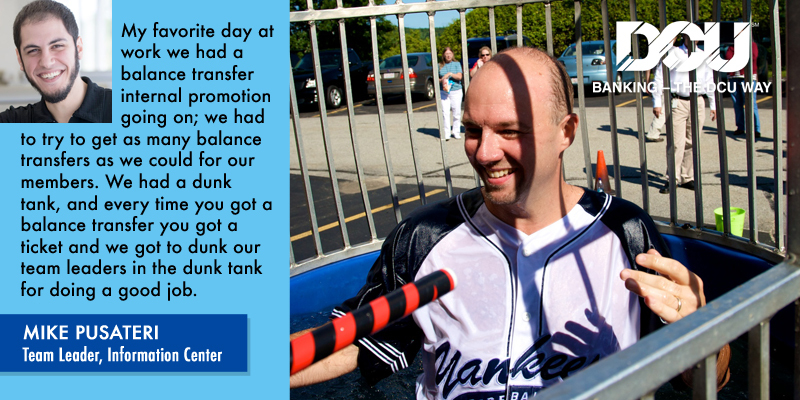 Our branches enjoy perks and fun events as well. Who doesn't love a visit from an Ice Cream Truck, raffles, a surprise gift box of prizes or treats, or a branch luncheon to celebrate Free Food Friday. Growth and member satisfaction are important indicators of how well we are delivering on our promise to our members. We recognize our employees make it happen. 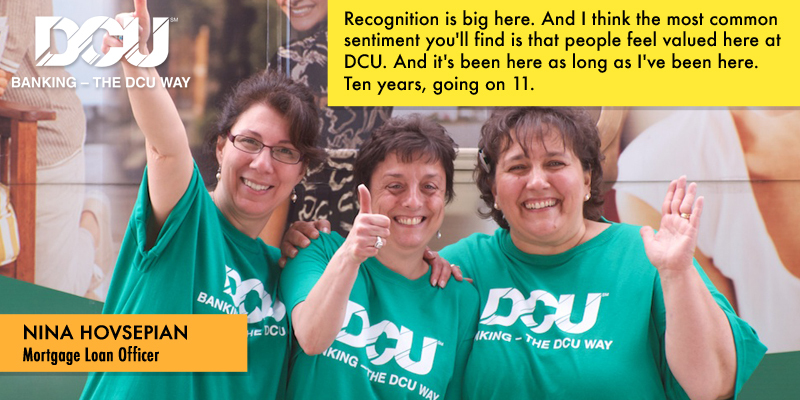 As a result, we reward employees for achievement through DCU's "Success Sharing" – a company-wide bonus program. By working together as a team to achieve common goals, every employee, with the exception of the CEO, is eligible to earn a bonus up to 10% of their annual salary. Our tenure recognition program is another unique aspect of our culture. Employees receive their choice of movie passes or a gift card in recognition of their yearly employment anniversary. 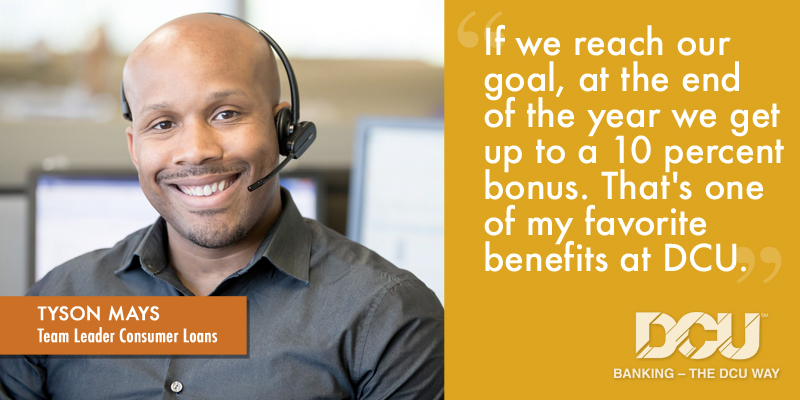 At five-year intervals, employees receive $100 for every year of service as well as a bonus vacation week. Also, the CEO and a representative from HR host a monthly, informal luncheon with the tenure recipients and invite the employees who have completed one year of service to join in on the fun. It's a great way to get to know each other, ask questions, and introduce long and short-term staff. They all share their experiences and DCU gains valuable insight about ways to improve work life.